Paleoclimatology is the study of past climate going back as far as possible into Earth’s history. Given that we are arguing over the trend and significance of the latest phase of global warming it may come as a surprise to know that there is good scientific evidence for what the climate was back in time to 542 million years ago (mya). More surprising still is that inferences about climate can be made even further back to near the formation of the Earth 4,540 mya. These inferences about the truly ancient past, long before complex life existed, are made from rocks. For the more recent times (1 to 542 mya) inferences come from oxygen isotopes in calcites from deep-sea sediment. Each of these measurements is obviously a proxy for real climate and they each have limitations. One significant advantage is that they are all independent of each other. Before we consider what these techniques can tell us it is important to put 542 million years into context. Geologists call the last 542 million years the Phanerozoic, it is the geological period we have been able to understand most clearly. Although 542 million years is an unfathomably long time, there was 4,000 million years of Earth’s history prior to this period. In the context of climate, all these major evolutionary events happened relatively recently. That is, in the last 20% of Earth’s history. And these are all extraordinarily recent. 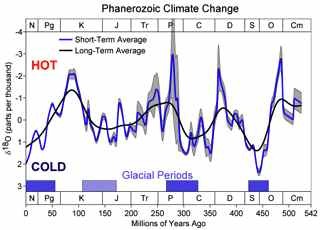 What does paleoclimatology say about the climate of the past? The climate has altered throughout, as has the composition of the atmosphere. All the proxies studied by students of paleoclimatology suggest that climate has been mostly much warmer than today, as we are still exiting a glacial period. There have been times when the Earth was both much colder and much warmer than today. The sea level has been both higher and lower. The polar ice caps have been bigger, smaller and, at times, absent. These data for the last 5 my comes from sediment cores. Although they cover only a fraction of the Phanerozoic, this graph shows a similar collective result to the longer time run from the rocks. What paleoclimatology tells us is there were times when it was hotter and colder than today. The long-term data back to 542 mya is patchy. We do not have a sequence of rock of reliable ages every millions years or so. It is not possible to populate this curve with numbers that reflect the kinds of variation that really happened, only the collective averages that produced the features we can detect in the rocks. What we have are averages that when we plot then they look smooth. What actually happened was more like the second graph. There was much more variation in climate that the data shows us. This is a limitation of the data. It does not mean that data are wrong, just that the resolution cannot show us everything that goes on. Your Facebook profile picture captures you in that whacky party pose, but it is only the ‘you’ at a specific moment in time. And although true, it cannot express the fullness of the real you. It is the same for the long-term climate data. 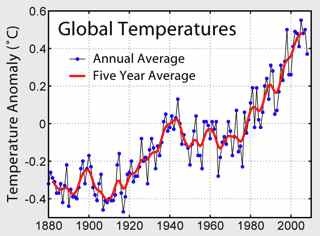 Climate varies far more than the data can resolve. The data points are closer together and can be a more accurate reflection of the real changes. But they do not go back far enough to cover even the recent past when the Earth was both warmer and colder than today. Consequently we are left with the interpretation from the more patchy surrogates.